Billed as some sort of Da Vinci Code ripoff, this book falls far short of expectations. 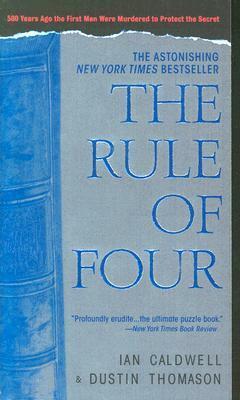 Centering around four friends at Princeton, including our protagonist Tom, The Rule of Four is trying to be a fast-paced thriller and a literary fiction piece. Tom has some baggage associated with his dad, who was a scholar studying a book called the Hypnertomachia, an ancient text filled with riddles and cyphers and the like. Tom’s dad dies/is killed before he can complete the study, and many other scholars are also in pursuit, including Princeton student Paul. Paul and Tom become friends, and Tom’s obligation to fulfill what his dad could not threatens to take over his life, leave him without a girlfriend, etc. There’s two other guys in this book, Gil and Charlie, and they’re not crucial to the action in the story, except they both get injured as a result of shenanigans that ensue due to the intrigue over this book. I hear Dan Brown has a new book out, so if you want to read that kind of book, I’d read that one instead. This was another book sale find for me. It wasn’t the worst thing I’ve ever read but it wasn’t the best, either. Now, onto some hopefully better reads! Always, always enjoy your comments and insights.